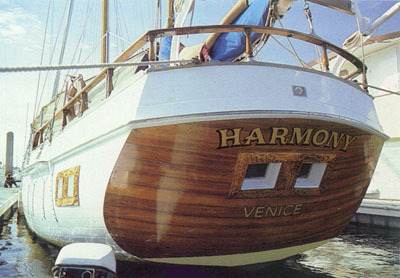 Beach Boy Dennis Wilson's Sailboat 'Harmony' ? Does anyone know the what has happened to the boat Dennis Wilson Drummer from the Beach Boys owned, I have heard a rumour it might be for sale? 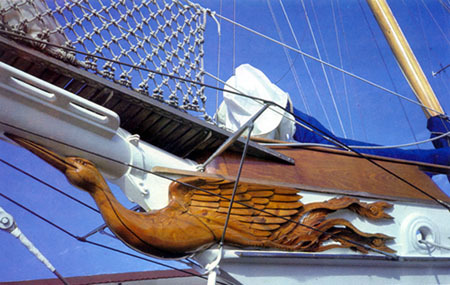 The Harmony was built in Japan in 1950 by the Azuma Boat Company for George T. Folster, a New Englander whose ancestors had sailed the Pacific in the days of the great whaling ships, The craft was christened Watadori (Bird of Passage), and the theme set by the original name was reflected in the carving of a bird under the bowsprit, as well as in the hand-carved designs in the cabinetwork below decks. Starting from blueprints drawn up by an American yachtsman, the craft was built from materials from all over the world: the wood includes teak from Burma, mahogany from the Philippines, and camphor wood from Formosa; the sails were imported from England; and the brass fittings were made in Scotland. The Harmony, with Marconi rigging, was not built for racing, but she is a fleet ship nonetheless. She was the first yacht ever to make a nonstop passage under canvas from Japan, a feat that was accomplished during a perilous forty-seven-day voyage, across five thousand miles of open sea, in the summer of 1952. On the voyage, she covered an average of a hundred miles a day; her best run was 158 miles for one day. Although the vessel has now put such long voyages behind her, previous owners have taken her on extensive cruises, and Wilson has sailed her to Catalina, northern California, and the Baja peninsula of Mexico. Hope this is the right place for posting. Will I ever rid myself of the leaky teaky fetish when I keep seeing pix of such gorgeous boats? Think Fisher. Yes, must think Fisher. Fisher. Fisher. Fisher. Ohhhhhhh. Its no good. Lets sneek another peek at the Galleon style transom. seeing pix of such gorgeous boats? Beware boat phots that show only close ups of the nice bits! The rest might be diabolical!!!!!!!! All that glitters isnt gold. Yea, because poor old Dennis dived over the side and never resurfaced. Is the new profile pic becuase you are newly in love and now more conservative, down to earth, home maker type???? What an assumption to make. Of course, I couldnt possibly comment, but it goes without saying one should always project ones best side. We live in hope, although his last matrimonial encounter left him a little jaded and sceptical, so Im not holding out too much hope. More importantly, its whats in your head and heart that ultimately endures, and means a lot more than a ring or certificate. Dennis Wilson died in 1983.